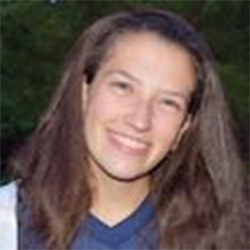 Alexis Schneider, the Charlotte Moran Memorial Scholarship recipient, will graduate from Upper Dublin this June. A captain and three-year starter for her high school team, Schneider played for The Warrington SC's 98-99 Dynamo team as well as the Eastern Pennsylvania Youth Soccer Olympic Development Program. In addition to soccer, Schneider serves as Vice President of Upper Dublin Robotics, plays saxophone and bassoon and volunteers at Ambler Ambulance Station. She will study Bioengineering at the Massachusetts Institute of Technology.